New pitches coming this fall! Get your product pitched professionally to marketers looking for new products! If you already have an effective video pitch, Tom Jourden can get it in front of the right companies who are looking for products. However, most inventors don't have a pitch tool that will secure a deal. Tom will create a customized, effective pitch video and then present it to marketers who are looking for products to put on TV and take to retail. 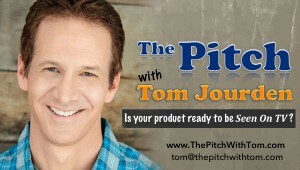 Watch Video Pitches Here on demand or at Youtube: The Pitch with Tom Jourden. You will also receive a link to the pitch video giving you a professional tool to sell/market your product. Want to sell your product on TV, but don’t have the contacts/funding/resources to make it happen? Tom Jourden has hosted over 60 infomercials from Abslide to Miracle Blade to Hoover to Rich Dad/Poor Dad resulting in one billion dollars in sales. With a background in sales and management for Fortune 500 companies, Tom has also produced, directed, and consulted on numerous successful DR campaigns bringing new products to market from beauty to weight loss to intellectual properties. Tom hosts an annual new inventor showcase at the largest direct response conference and is a ‘turnaround specialist’ taking unsuccessful shows and turning them into hits. Tom has also been an actor, voice-over artist and reality TV host for over 20 years including hosting Travel Channel’s ‘Amazing Vacation Homes’. Tom’s vast resource of contacts will help insure that your product gets seen by the best in the industry. To learn more about Tom, click on the tabs at the top.